Learning to balance within easy reach of the floor is a lot of fun. Balance is quickly learned without the distraction of pedalling and once mastered, it's then just a small step to move onto a bike with pedals but without stabilisers. A rear brake helps those new to riding with an early understanding of how to slow down. 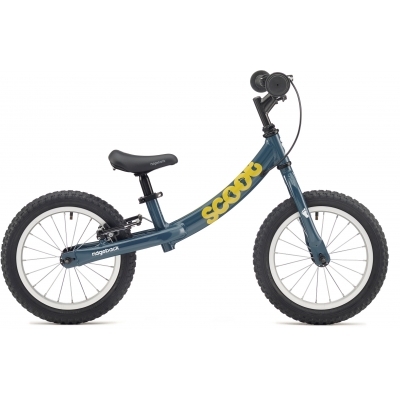 Available in 12in and 14in wheels sizes to cater for varying heights, Scoot has a very high specification level including a lightweight alloy frame, alloy rims and semi-slick tyres. The saddle incorporates a neat carry handle for those tired or tantrum moments and with full bearings throughout, domed wheel nuts as well as an alloy V-brake, there is no better beginner bike. 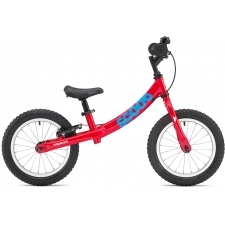 Buy your Ridgeback Scoot XL Beginner Balance Bike, 14in Wheel, Blue 2018 from Revel Outdoors.